Iron Giant Geeki Tiki | Nerd Much? Have you heard of the 1968 sci-fi novel “The Iron Man” by British Poet Laureate Ted Hughes? Well, if you haven’t, you are not alone. However, you are probably familiar with the plot. Director Brad Bird delighted audiences everywhere with the animated film adaptation, known as The Iron Giant. Based primarily on Hughe’s Novel, the movie teaches an ever-important lesson; you are who you chose to be. Set in 1957 Rockwell, Maine The Iron Giant follows the story of two unlikely friends, 9-year-old Hogarth Hughes, and a colossal robot that falls from the sky. After falling from space and landing outside of a small town, the Giant is befriended by non-other than the exceptionally well caffeinated Hogarth Hughes. Hogarth tries to protect the Giant from a meddling government agent who wishes to destroy the Giant and will stop at nothing to do so. While following a similar storyline as Steven Spielberg’s E.T., The Iron Giant, sadly did not receive the same attention or acclaim, which is why it’s on our list of the most underrated animated movies of all-time. Still a classic for those of us who fell in love with the wonderful Giant, it is hard to get enough Iron Giant memorabilia. So, do you love the Iron Giant as much as Hogarth loves coffee? Or maybe you love coffee as much as Hogarth? Well either way, we have the perfect thing for you! The first officially licensed Iron Giant Geeki Tiki! A perfect combination of both the beloved Iron Giant as well as the classic tiki styling you expect, this cup represents Nerd memorabilia in style. Measuring 9 1/4″ tall x 6″ wide x 3 1/2″ deep this Geeki tiki holds a colossal 28 ounces of your favorite beverage. Made from a heavier ceramic than the classic tiki, and coated in a shiny metallic glaze, it is hard not to fall in love with the Giant’s big shiny eyes. Get lost in the calming blue of his eyes, or the endless possibilities of how you will fill your new cup. 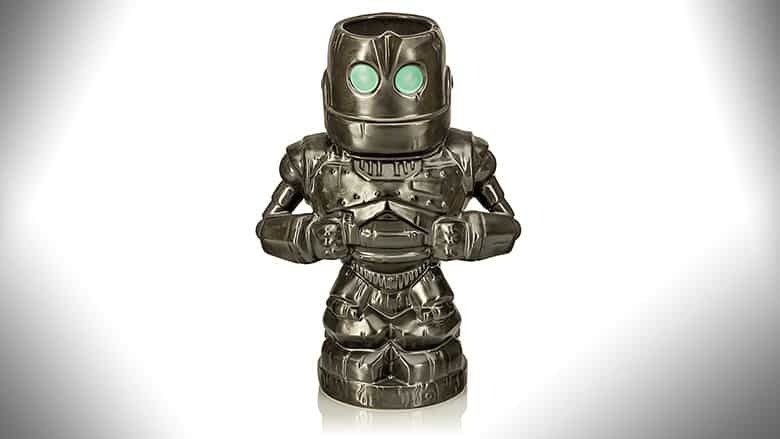 Stay hydrated in style and add this Iron Giant Geeki Tiki to your collection today. Buy the Iron Giant Geeki Tiki at ThinkGeek.